All shows are all-ages unless otherwise noted. Generally for concerts and special events, guests two years of age and older are required to have a ticket for entry. Fiddler’s Green Amphitheatre uses walk-through metal detectors for all events. Guests should allow extra time for entry in the venue. Camera policies are different for every event. Generally personal cameras are allowed in the venue. Flash photography, video and professional cameras (A camera with a detachable lens or a lens that extends more than 5 inches) are not permitted without prior venue approval. At tour / artist / other request this policy may change for any given event, if you have concerns or questions about a specific show please contact the venue. BBVA Compass clients are eligible for complimentary access to the BBVA Compass fast lane at all shows. Present your BBVA Compass credit or debit card at the VIP entrance (north side of the venue at Marjorie Park) to access the fast lane. Offer is first come, first serve and subject to availability. Management reserves the right to handle each occurrence on a case-by-case basis. Prohibited items can be show specific, please contact the venue within a week of the show with any questions. No large bags, large backpacks, suitcases, beach bags, equipment bags, hard case containers etc. No Fireworks, smoke bombs, etc. No Skateboards, roller blades, roller skates, roller shoes, etc. No Unapproved pamphlets, handouts, advertisements, etc. All guests entering Fiddler's Green Amphitheatre are subject to search by metal detecting hand wands or hoods and/or pat downs. Additionally, all small bags, briefcases, and purses are subject to search at venue entrances. Any guests involved in a physical or verbal altercation are subject to ejection without refund and arrest. There is NO overnight parking in the lots surrounding Fiddler’s Green Amphitheatre. You must have legal proof of age and be over 21 years of age to consume alcohol. Any guest who is intoxicated before entering Fiddler’s Green Amphitheatre may be denied entry to the facility without refund. Any guest found intoxicated within Fiddler’s Green Amphitheatre or causing a disturbance as determined by management, will be asked to leave the facility without refund and may be subject to further consequences. Fiddler’s Green Amphitheatre does not allow alcohol (including bottled wine) to leave the venue. There will be a limit of two alcoholic beverages sold to each guest, per purchase. To encourage responsible drinking, Fiddler’s Green Amphitheatre and Aramark participate in the Designated Driver program. The Designated Driver program promotes responsible consumption of alcoholic beverages. Fiddler’s Green Amphitheatre management reserves the right to eject without refund and/or cite any individuals under the age of 21 who illegally purchase, possess, or consume alcohol or are visibly intoxicated. Individuals providing alcohol to those under 21 will also be ejected without refund and subject to citation. The cutoff time for alcohol sales varies by event. Please contact any guest relations staff for more information. Alcohol cutoff times are subject to change. Guests found with alcohol brought from outside the facility may be ejected without refund. Colorado state law prohibits smoking marijuana in public. Any guests smoking in a non-designated area will be subject to ejection without refund. The Fiddler's Green Amphitheatre Box Office is currently closed for the season. Box Office will fully re-open for the 2018 season – date TBA. The Fiddler's Green Amphitheatre Box Office will be open event days starting at Noon. For accessible seating at Fiddler’s Green Amphitheatre follow the ACCESSIBLE SEATING link on the AXS page for the event you’d like to purchase. 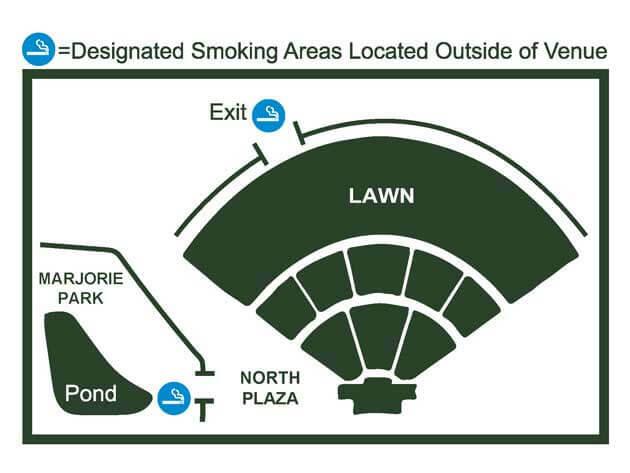 Accessible seating at Fiddler’s Green Amphitheatre is located in sections 101, 102, 103, 202 and 204, as well as throughout the lawn. Ticket limits set by the promoter/performer for each show will be applied to accessible seating areas as well. Fiddler’s Green Amphitheatre is unable to verify or guarantee the authenticity of tickets that were not purchased directly through an authorized sales channel (i.e. Fiddler’s Green Amphitheatre Box Office, AXS charge-by-phone, AXS.com). For this reason, we do not recommend purchasing tickets from third-party resellers. If a ticket is purchased through a third-party reseller, Fiddler’s Green Amphitheatre is not responsible for any fraudulent activity and will not honor invalid tickets. Fiddler’s Green Amphitheatre re-entry is NOT permitted except in designated emergencies and severe weather conditions.